The aroma was intoxicating; it wafted up from tables where nine varieties of rich brown Arabica coffee sat awaiting their fate. The color and scent were promising, but the final test remained. How would it taste? More than 100 people were packing the room to find out. Because this wasn’t just any brew. After decades of self-imposed isolation, Burmese coffee was making its international debut at the Specialty Coffee Association of America Expo in Atlanta, the largest specialty coffee event in the world. That the Burmese coffee got here at all was due to the efforts of USAID, Winrock International and its partners — and to volunteers like Rick Peyser, who spent two weeks helping smallholder farmers on coffee estates in Burma (also known as Myanmar), as part of a Farmer-to-Farmer assignment in late 2013. 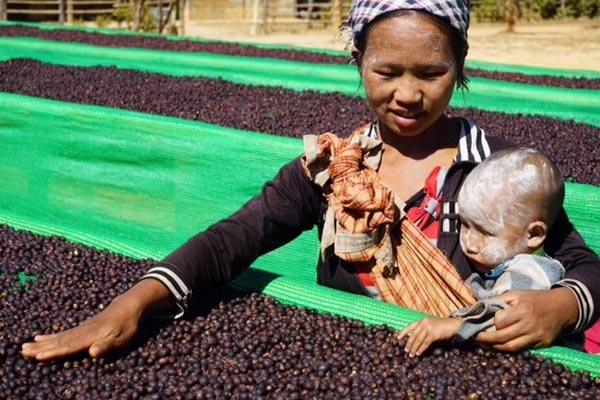 Sun-dried natural coffee cherries in Burma. The USAID Value Chains for Rural Development project has been working with smallholder coffee farmers since 2014, providing training and support for best agricultural practices, post-harvest techniques, coffee roasting and more. But the speed of this transformation is truly a testament to the coffee producers. These innovations have not gone unnoticed. Just last February, the Value Chains for Rural Development project and the nonprofit Coffee Quality Institute arranged a visit to Burma for coffee buyers. The group included elite roasters and importers from Seattle, Los Angeles, Princeton and St. Louis, as well as buyers from the United Kingdom and New Zealand. It was “the coffee trip of a lifetime,” said Craig Holt, owner of Atlas Coffee Importers. In fact, the interest it generated is why those steaming cups are awaiting their fate in Atlanta. And now, the big moment has arrived. The tasters sip, they slurp, they savor — and they can’t stop talking about Burma’s coffee. Based on this impressive debut, a Seattle-based importer buys the first two shipping containers (approximately 36 tons) of Burma-grown coffee for sale in North America. And four more traders (two in the U.S. and two in Australia) are looking to source coffee from Burma and are willing to pay premium prices for high-quality Arabica. After decades of obscurity, Burma’s beans are on the map — and smallholder farmers will reap the benefits.